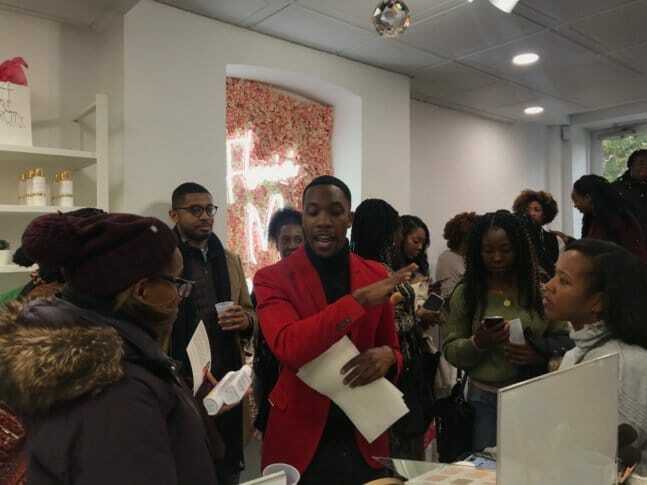 WASHINGTON — As pop music blared through the speakers, customers packed into the Brown Beauty Co-Op in Northwest D.C. for its grand opening on Saturday afternoon. Makeup artists and hair stylists helped women perfect their looks before they posed in front of a wall of balloons or a neon sign to snap a quick selfie. The sign read, “Flexin’ My Melanin” — a common theme that day. Kimberly Smith is a co-owner of Brown Beauty Co-Op and the founder of Marjani Beauty, an online store featuring beauty products tailored to women of color. She started the website after her own experience struggling to find beauty products for her skin tone. Amaya Smith, originally from Silver Spring, Maryland, started Product Junkie Naturals, a line of hair products for women of color. With Kimberly’s curated selection of cosmetics, the two African-American women have created a one-stop shop in Dupont Circle for women of color to find all their beauty products. “It’s kind of a reverse gentrification, bringing black-owned businesses back into the community,” Amaya said. Monica Lewis, a D.C. native, said she rarely wears makeup because she isn’t able to find the right shades to match her skin tone. Muslimah Carpenter, a student at Howard University, said she made time to go to the grand opening in the middle of finals season. A self-described Instagram influencer with over 30,000 followers on the social media platform, Carpenter said she is passionate about supporting black-owned beauty businesses. Now, there’s one in Dupont Circle.